Benjamin Del Vento, Sr., Baltusrol G.C. Brian R. Hunt, Upper Montclair C.C. Edward J. Batta, Essex Fells C.C. Laura Benevento, Canoe Brook C.C. 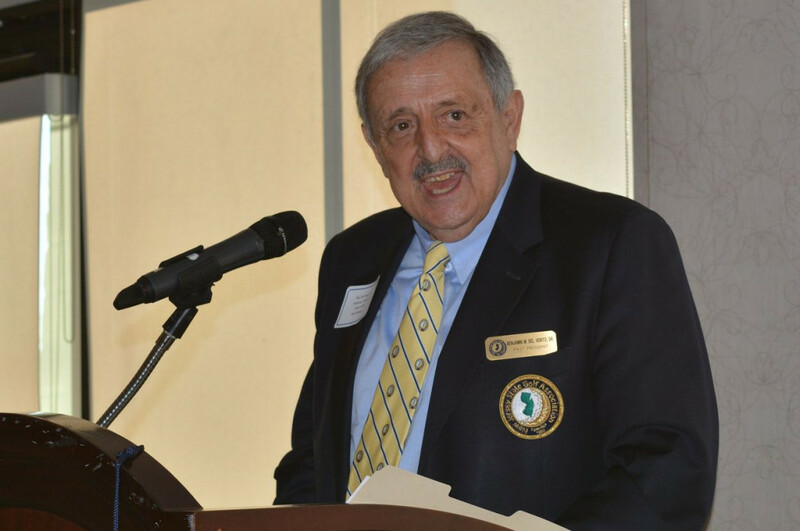 Robert D. Cronheim, Watchung Valley G.C. Thomas J. McGovern, Hackensack G.C. Jay S. MacNeill, Plainfield C.C. John F. Rochford, Echo Lake C.C. Thomas J. Paluck, Baltusrol G.C. Greg Baker, Rockaway River C.C. Gene E. Benzenberg, Ridgewood C.C. Peter Borst, Canoe Brook C.C. Donald K. Brief, Crestmont C.C. David M. Epstein, Crestmont C.C. Jeffrey M. Liebler, Warrenbrook G.C. Michael F. McFadden, Fairmount C.C. Brian G. Steller, Echo Lake C.C. Dirk Van Emburgh, Ridgewood C.C. Bill King, a New Jersey PGA Hall of Famer and former NJSGA Caddie Scholar, has been named the Director of the Caddie Scholarship Foundation. Bill, as resident of Wall Township, graduated from Rutgers University in 1979 as a Public Relations/Marketing major and a Mechanical Engineering minor. As a Caddie Scholar at Rutgers, he was a member of the golf team and served as captain his senior year when the team went undefeated. Inn 1978, King won the New Jersey PGO Public Links Championship. Following graduation, he turned professional and earned his PGA membership in 1984. He has served as a PGA Board Member and as a Trustee on the Caddie Scholarship Foundation since 2009. In 2009 he was recognized by his peers as the New Jersey PGA Golf Professional of the Year and, in 2013, was inducted into the New Jersey PGA Hall of Fame. He has won two New Jersey PGA Championships and the NJSGA/NJPGA Senior Open. He has also competed in the U.S. Amateur, the PGA Championship, the U.S. Open and the U.S. Senior Open. Most recently, he served as the PGA Head Professional at Spring Lake Golf Club for 27 years. King's wife, the former Pamela Farrell, won the New Jersey PGO Women's Public Links Championship in 1988. They have two children, Katie and Will, a former NJSGA intern. Sheila Menendez is a graduate of Brooklyn College with a major in sociology and a minor in education. She has recently retired from her position at Rutgers University after 26 years as a senior financial aid officer. In this role, Sheila counseled students and their families as to financing their education. This position entailed detailed analysis to determine the students' needs and awards. Sheila has recently been selected to join the Board of Directors of the Guild of Creative Art in Shrewsbury, N.J. In this position, she has designed and will manage a scholarship program to award funds to a graduating high school senior who will pursuing a career in the visual arts field. She is also a member of the American Association of University Women (AAUW), the largest national organization dedicated to the advancement of women through education, advocacy, philanthropy and research. As of 2012, Sheila has assumed the role of Director of Education of the Caddie Scholarship Foundation. Sheila is happily married and has four grandsons. Mike Menendez received his Bachelor and Master of Arts degrees from Seton Hall University. He subsequently worked in the administration there becoming the Director of Student Financial Aid. After leaving Seton Hall he worked as an educational software consultant for SCT. His primary client was the University of Medicine and Dentistry of New Jersey. His specialty at UMDNJ was training and supporting the financial aid staff on the use of their database software. Michael, who no longer works full time, has been pursuing his lifelong love of photography. He has had several exhibits and has won many awards for his images. He is also an avid golfer, persistently pushing to lower his handicap index. In good weather he prowls the Monmouth County courses two or three times a week. Being experienced in database design, he loves helping his wife Shelia manage the Caddie Scholarship applications. The NJSGA Caddie Scholarhip Foundation has had the overwhelming support of each NJSGA president and his respective board since the program's inception. Our golf championships touch a relative few of our member clubs, but the CSF program touches everyone.